Over the last 15 years, Mountain Pine Beetles have killed large tracks of ponderosa pine across the Black Hills of South Dakota. Beetles thrive with continuous stands of dense trees, and decades of fire exclusion have led to that landscape and stand-level condition. That favorable habitat may help explain why the current epidemic of this native insect has been so severe. 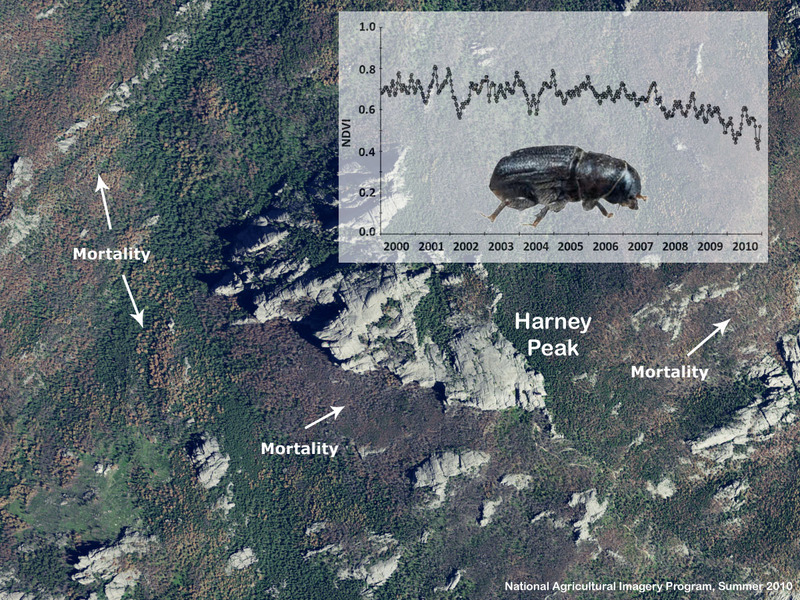 In this summer 2010 aerial photograph, the patchy structure of recent and older tree mortality shows up well around Harney Peak--the highest elevation in the Black Hills. The graph inset shows that greenness has steadily declined since 2006, as more and more trees were affected.